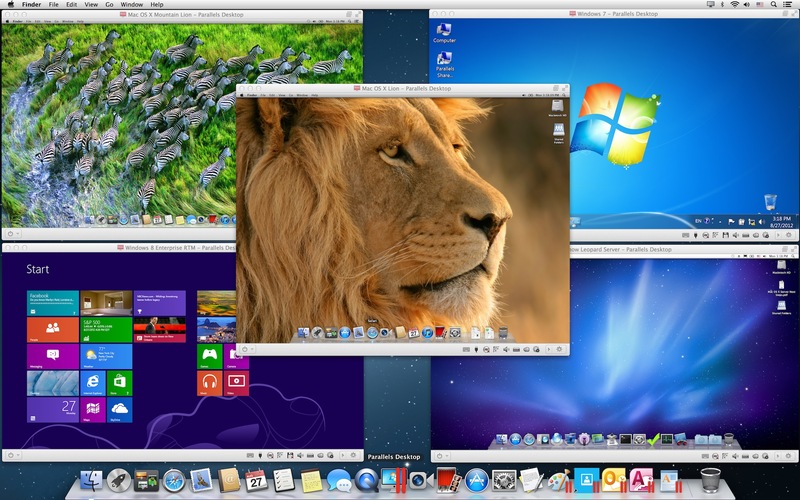 If you’ve ever fired up a virtual machine on your Mac, then there’s a good chance you did so with one of the top two suites out there: Parallels Desktop or VMware Fusion. Both are perennial favorites among Macheads and there’s a lot to like in both suites. But Parallels 8 throws the gauntlet in a major way, offering closer integration between OS X and Windows than I’ve ever seen in a virtual machine environment. The team pulled out all of the stops to make using Windows apps and even entire desktops a seamless and pleasant experience on any Mac, including the new Retina MacBook Pro. Right out of the gate, Parallels 8 brings the big guns, fully supporting a Retina Windows 7 experience on your shiny new MacBook Pro. If you’ve tried it, you know that Windows running in Bootcamp isn’t Retina-ready by a longshot. That means that the Parallels team had to figure out a way to render its own version of a Retina enhanced Windows desktop, and it did, Windows apps and most UI elements look great at Retina resolutions when used as a VM. But Retina isn’t the only thing that Parallels 8 brings to Windows. You also get Windows apps built right into your Mountain Lion launchpad, clearly marked with the Parallels bars so you know that they’re just guests. Each app can be run in the Windows virtual machine or in seamless Coherence mode that lets you run them in a window right alongside your Mac apps. The apps can be run in full-screen as well, with complete support for Mission Control. They’ve even pulled some fancy tricks with the mouse cursor. If you move at speed toward the edge of a VM window, it will pass over the border without pause. If, however, you’re moving more slowly, it will stop at the edge of the window. This lets you hit those tricky hot corners and side pixels that are so prevalent in Windows 8. The app-by-app integration doesn’t stop there, though. There’s an ‘open in IE’ button added to Safari for you so that you can open pages hard coded to work in Internet Explorer seamlessly without even having to dip into your VM to launch it. Apps like PowerPoint also work perfectly in presentation mode, letting you mirror a slideshow right from inside a VM. If you want to start a new mail in Outlook that already has a picture attached, you can just drag an image right onto the Outlook icon, just as you do with Mail.app. 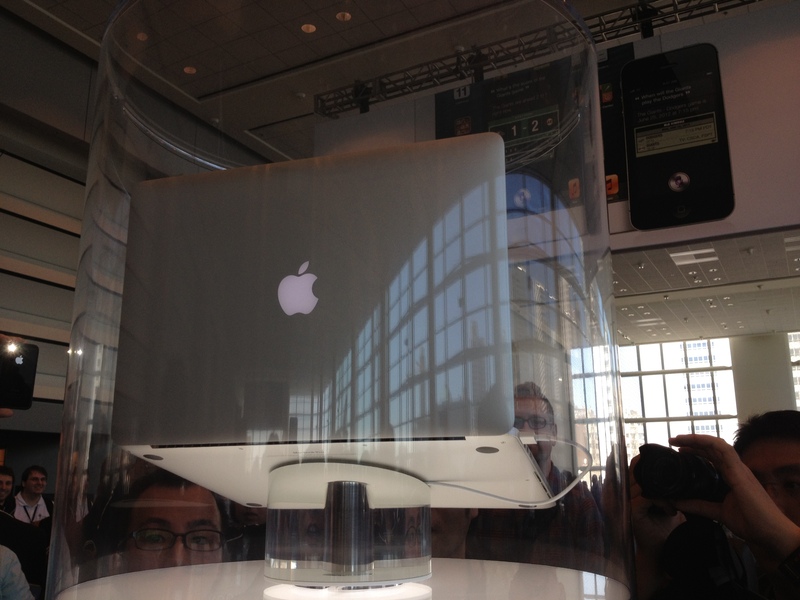 Beyond individual apps, a bunch more of Mountain Lion’s most distinctive features are also supported in Parallels 8. You can use Mountain Lion’s new voice dictation feature in any Windows app that accepts text. This behavior mimics the way that it works natively in OS X so well that the effect is almost completely seamless, it just works. They’ve also hooked Parallels up to Notification Center, allowing Windows apps to send notifications out to the center instead of their standard alerts in Windows. Their icon, superimposed with the Parallels bars, even appears right in the notification. It’s really an incredible implementation. You can also drag and drop any file right between your VM and your OS X machine, or vice-versa. This is one of the most requested features for any VM user, so it’s nice to see it arrive in the new Parallels. All the stock Mountain Lion gestures are also supported in any of your unlimited allowance of Virtual Machines. Any changes made to keyboard language in OS X automatically sync up with Windows as well, it’s all very slick. Parallels Desktop 8 also gets a nice performance boost over version 7. Parallels says it’s up to 30% faster for read/write operations, 30% faster for games and up to 25% faster on boot, suspend, shutdown and resume actions. You can run Parallels from a USB stick, and it also supports downloading the Windows 8 Release Preview right from inside the new VM wizard. Parallels Desktop 8 for Mac is available starting today as an upgrade for current Parallels Desktop for Mac users only for $49.99. New customers will have to wait until September 4th when they can get it in Apple stores, or a bunch of other online and in-store outlets. 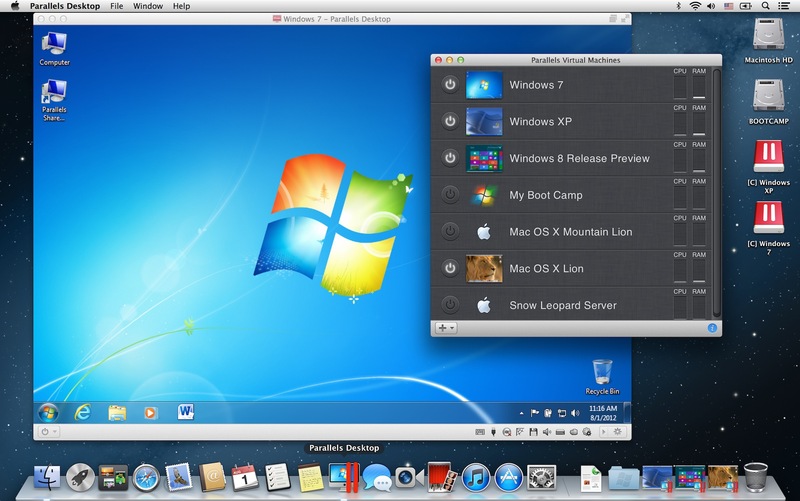 Parallels Desktop 8 for Mac is $79.99, and the Student Edition will be $39.99. Parallels 8 also comes in a Switch to Mac Edition with cables and special instructions for switchers at $99.99. If you’re currently using Parallels competitor VMware Fusion, they’ll also give you the $49.99 upgrade price. There are also a bunch of subscription and enterprise options. If you bought Parallels 7 for Mac any time after July 25th, you’ll get a free upgrade at no charge.